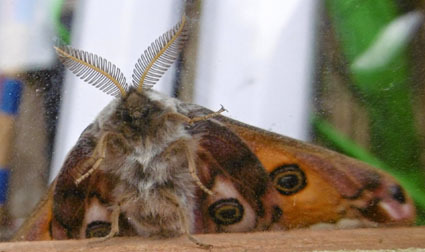 I'll divert ever so briefly from moths to show the composite picture above, and to encourage you, whatever your age, in my belief that rowing is every bit as enjoyable and interesting as is the study of moths. In wildlife terms, you get a wonderful vantage point for watching the world when afloat. Back to moths. It was a chilly night and I was not expecting anything too exciting, but it was good to have the three agreeable visitors shown above, plus a strange beastie from the fly-type of insect, shown above. Talking of flies, we have the hideous Blandford Fly back here for its annual six-week rampage. A truly nasty little black fly with a horrible bite, it is one of the few serpents in our Paradise. I am very pleased with my lovely clean eggboxes, mostly kindly donated by neighbours. Alas, because of moths' habit of creeping into the cones and crevices, they will all be bent and battered soon by my struggles to get good photos. Update: the inestimable Dave Wilton of the invaluable Upper Thames Moths blog, tells me that the strange beastie "appears to be a midge of the non-biting variety (hooray for that) from the family Chironomidae, of which there are a lot around at the moment." He adds: "It would need a fly expert to get any further than that, if indeed it is possible at all, just from a photo. I see there are 600+ species to choose from." And that's 599 too many for me.